A Modern Understanding of Trolling Speed. Hi all fishing lovers, Today’s post is “A Modern Understanding of Trolling Speed”. We hope this informative article is a good choice for you, all fishing lovers. Trolling speed can and does make a profound difference in fishing success. 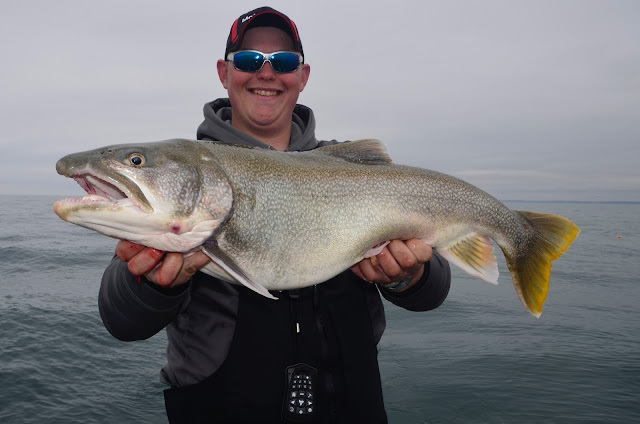 Certain species like this magnificent lake trout caught by Jake Romanack are more readily caught at slower trolling speeds than other species. Next to target depth, the most important variable associated with trolling can be summed up in two words… boat speed. Understanding trolling speed is essential for anglers who plan to mix two or more common fishing presentations in the same trolling pattern. It’s true that understanding what trolling speeds produce best with specific trolling hardware is important, but there is a lot more to understand about trolling speed. Most serious anglers agree that trolling speed is a decisive strike triggering element. Because lure action changes as boat speed is increased and decreased, anglers can fine tune a trolling bite by making controlled adjustments to the trolling speed. Often it only takes a minor change in speed to literally light up a bite! This is precisely why many trollers lecture to avoid trolling in a straight line, but rather to troll in a lazy “S” pattern. A wandering trolling path is essentially speeding up baits pulled on the outside turn and at the same time is slowing down those baits on the inside turn. If while trolling the lazy “S” pattern more bites are occurring on the outside turn, this is an indication that speeding up the overall trolling speed is in order. On the other hand, if more bites are coming on the inside turn this is suggesting that slowing down the overall speed is in order. key to making an “Okay” bite into an “Exceptional” bite! Historically most open water trolling chores have been conducted with the help of a small gasoline outboard commonly called the “kicker”. Kicker motors these days are largely four stroke outboards that are noticeably finicky when it comes to running at a consistent RPM range. Because four stroke outboards don’t idle and slow troll at a consistent RPM range, trolling speeds tend to vary constantly while fishing. Some might imagine this is an advantage in terms of finding the “most productive” trolling speed on any given day. The problem is because the trolling speed is constantly fluctuating, it’s tough to pin down exactly what speed is triggering the most strikes. The solution to this kicker motor problem is to invest in a after market throttle control. Both wireless and hard-wired models are on the market that use a rheostat to stabilize the speed and also to make precise changes to trolling speed. Panther Marine Products is an industry leader in developing throttle controls for outboard kicker motors. With the help of a throttle control it’s possible to adjust and maintain trolling speeds as small as 1/10th of a mile per hour. The gasoline kicker motor is the workhorse of small boat trolling, but increasingly more and more anglers are also incorporating GPS guided electric motors in their trolling regiment. The advantages of these electric motors are profound. For one, because electric motor thrust is controlled by a rheostat switch, it’s possible to make and maintain very precise changes in trolling speed. Secondly, because these electric motors can be set to follow a compass heading it’s possible to duplicate productive trolling passes in a way never before possible with conventional trolling technology. Thirdly, GPS guided electric motors also allow anglers to set down specific waypoints and program the electric motor to navigate from waypoint to waypoint. This feature essentially allows the angler to follow meandering weed edges or drop-offs like a beagle following a rabbit track! The MotorGuide Xi5 uses the unique Pinpoint GPS tracking technology that allows anglers to benefit from several critical trolling functions including Heading Lock, Route Playback and Cruise Control. In the Heading Lock mode the unit will follow a course and maintain that course precisely. In the Route Playback mode up to eight different trolling routes can be programmed and duplicated again and again. The Cruise Control mode allows for a trolling speed to be precisely maintained while in Heading Lock or Route Playback mode compensating for the effects of both wind and current. highly refined and controlled trolling speeds. Since the invention of GPS guided electric motors a growing number of anglers are incorporating both a gasoline outboard and electric motor into their daily trolling regiment. Depending on the target trolling speed either a kicker motor or a primary outboard can be used to generate the desired speed. The GPS electric motor is in turn used to tweak trolling speed and also to provide GPS navigation chores. The Fishing 411 crew uses this two motor trolling option routinely. For salmon, trout, pike, musky and warm water walleye fishing where trolling speeds are 2.2 to 3.0 MPH the primary outboard is generally used in combination with the GPS guided electric motor. Many modern V6 outboard motors have special throttle controls that make it easy for anglers to dial in specific trolling speeds. The Evinrude G2 fly by wire throttle controls can deliver amazingly refined throttle adjustments. A digital gauge clearly shows the percentage of throttle making it possible to make adjustments as refined as 1% of throttle! 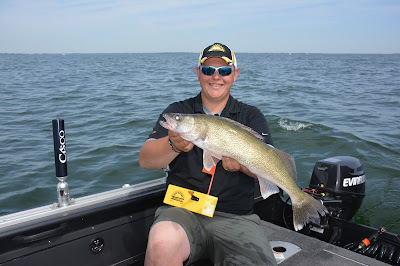 For slower trolling speeds commonly used for targeting cold water walleye, brown trout or lake trout, a gasoline kicker motor is used in combination with the GPS guided electric motor. When trolling at ultra slow speeds such as walleye live bait rigging or cold water crankbait trolling, trolling with just the GPS guided electric motor is the ticket. 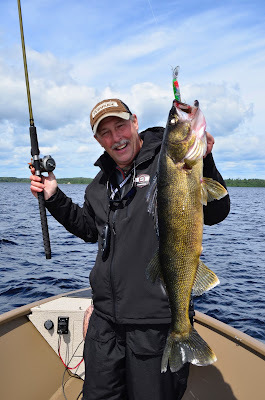 A typical 36 volt electric motor will troll a 20 foot “walleye boat” for about 12 hours on a full battery charge. Between the primary outboard, kicker motors and GPS guided electric motors, there are virtually no trolling situations that can’t be mastered with these products. The trolling speeds indicated by a GPS unit are of course the speed over ground the boat is maintaining at the water surface. Below the surface things can and often are much different. Subsurface currents are a common problem associated with trolling in the Great Lakes and other deep water natural lakes. The Fish Hawk X4D is a probe that mounts to a downrigger ball that effectively provides anglers trolling speed, depth and critical temperature information at depth. The system functions via a transducer based signal eliminating any need for special downrigger cables to transfer data. By monitoring the trolling speed at depth it’s possible to detect subsurface currents and make sure that trolling gear at depth is fishing at the proper speed. Without the help of electronics like the X4D unit an angler is literally guessing what speed his gear is fishing at depth. Trolling speed is one of those fishing variables that seems straight forward, but in truth is a highly complex subject. Those anglers who embrace trolling speed as a means of triggering strikes are in the fast track to fishing success. To the anglers who ignore trolling speed and the impact it has on open water trolling, maybe they would be more successful at golf?